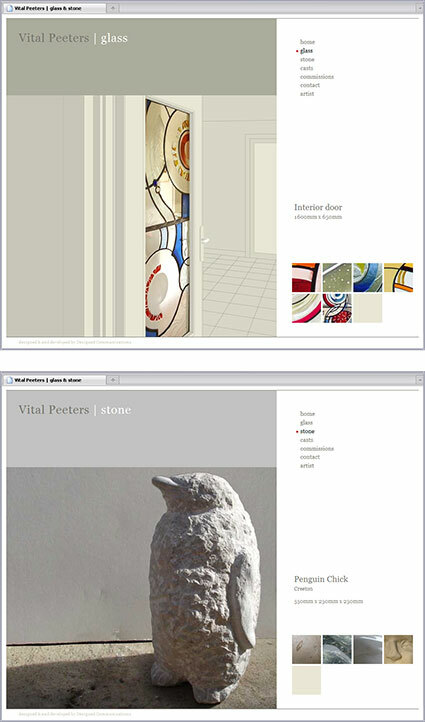 Create an online portfolio of Stained Glass and Sculpture for artist Vital Peeters; make the site as easy to navigate as possible; let the artwork speak for itself. The site needed to be effortless to navigate. The user journey is led entirely by the visitors desire to see more of the work. It is impossible to take good photographs of stained glass windows. In order to appreciate the transparency and luminance of stained glass, it must be lit from behind. As a concequence, the interior becomes inevitably under exposed and gloomy. Add to this the fact that the interior spaces are often a little shabby (or as in this case have modern double glazing units covering them) and it becomes a challenge to focus the viewers attention on the artwork alone. The solution in this case was to illustrate the interiors so that they became subtle tonal contexts for the windows to sit in. All the extraneous detail was removed, creating a calm visual environment to enjoy the glass work.